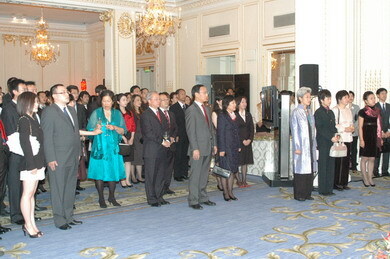 The reception was launched amid solemn national anthem. 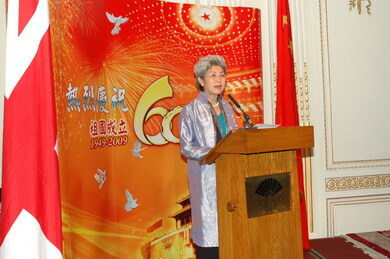 Ambassador Fu Ying began by extending her sincere greetings and holiday wishes to all the attendants. Fu Ying said, 68 years ago on the 18th of September, China was thrown into the abyss of disaster. 68 years later, the Chinese nation has walked out of the historical shadow and marched on a development path for national prosperity. In Chinese culture, 60 years is seen as a complete cycle. The 60 years between 1949 and 2009 will mark a bright chapter in the history of Chinese civilization, as the country has successfully transformed itself from one of decayed backwardness to one of prosperity and strength. The past 60 years has seen an increase of 77-fold in China's overall economic capacity, 32 folds in its per capita GDP and 985 folds in its fiscal revenue. It churned out more wealth in a single day in 2008 than the whole year of 1952…… . Fu Ying said the military parade on 1 October will demonstrate the country's national strength, military power and national unity. On that special day, the world will cast its eyes on China and ask, what is it that the Chinese want to do? My answer would be, China wants development, Chinese people want better lives and the Chinese nation wants to move forward. Fu said that she read about the personal memories that people shared on the websites. Many of them saw their life changed when coupons went out of use, wooden benched were replaced by sofa and food and clothing were no long a family problem. Fu said that China was not rich when she was studying in UK in the 1980s and she had never imagined that parents in China could one day afford to send their children aboard to study. As of now, the number of self-financed Chinese students studying in UK has reached 80,000 and is still rising. This in itself has reflected how things have changed in China. Nevertheless, China is still a developing country with a per capita GDP of around 1/13 that of UK, ranking below 100th globally. The journey towards modernization and middle-level developed country remains long and hard. Fu went on to brief the audience on China's economic situation. She said that although China had suffered heavily from this financial crisis, its economy is on steady recovery after one-year effort; however, the country still needs to continue with its existing macro-economic policy. Li Zelin, President of the Chinese Students and Scholars Association in the UK, addressed the reception on behalf of the Chinese students in the UK. He said, overseas Chinese students are all excited and rejoiced at the 60th birthday of the motherland and their residence abroad has never kept them from sharing the pride of the tremendous changes taking place in the motherland. As of now, bilateral educational exchange is getting much closer, with growing size and younger and more educated students. What remains unchanged, however, is their shared love for their homeland and loyalty for the people. Forums on employment and entrepreneurship, recruitment fairs and workshop on the sustainable development of doctorate graduates will continue to be hosted and other measures taken to encourage and assist exchange students to return to China, start their own careers and contribute their role to the country's modernization drive and the great rejuvenation of the Chinese nation. 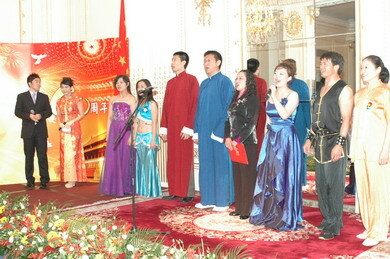 The reception went on with performances contributed by students and diplomats. 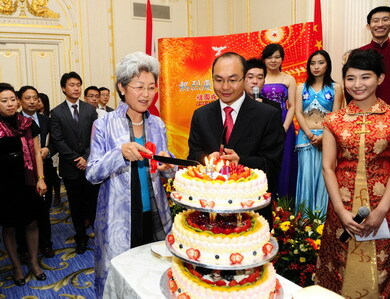 A big birthday cake was shared to celebrate the 60 years' splendor of the New China and wish for a more splendid future for the Chinese nation.